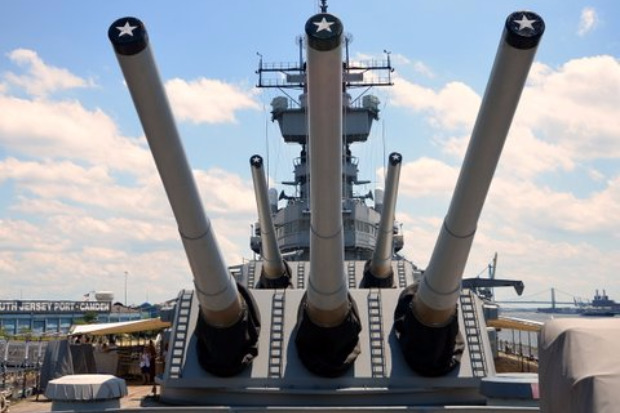 Tour our nation's most decorated and largest battleship -- the Battleship New Jersey Museum and Memorial, located on the Camden Waterfront, NJ. That's right, now you can experience the Fire Power audio tour every day! Climb inside the legendary 16-inch turret, watch the launch and track a tomahawk missile in the Combat Engagement Center, learn how the crew lived aboard this floating city and much more! The audio device features narration throughout the tour route, historical accounts of life aboard the ship by crew members, and even sound effects! When visitors first witness the Battleship New Jersey, they are amazed at its sheer size. Nearly three football fields long and over 11 stories high, the Battleship New Jersey was the longest battleship ever built. Marvel at its three turrets, each with three 16-inch guns, which used to fire a six-foot long projectile weighing as much as a Volkswagen Beetle an incredible 23 miles. Once visitors step onto the “Big J’s” teak deck, they realize that this is one incredible vessel. Built in the Philadelphia Naval Yard and launched on Dec. 7, 1942, the grey lady looks pretty good for her age. Along the tour route you’ll see a few of its upgrades over the years, including the installation of Tomahawk and Harpoon missile launchers and the Phalanx defense system — a computerized gun that could fire off 3,000 rounds a minute. But you don’t have to be a Navy Admiral to view the New Jersey, the most decorated Battleship and surviving warship in US History. Look for our new tour of the engineering spaces coming soon! This overall view of the Battleship NJ takes guests 5 levels up and two decks below. The Main Deck features an Exhibit/ Museum that encompasses the 48 years in and out of service. Guides are available for questions in the Captain’s Quarters and CEC. Active Military, World War II Veterans and former Crew Members of BB-62 are asked to stop at the Box Office in the Battleship NJ Visitor’s Center. Proudly inform our Ticketing Staff of your service to our Great Nation and receive a complimentary ticket to board the “Big J”. Children 4 & under are free! Visit Ticket Office for complimentary ticket. Fire Power tours include an audio devise with narration throughout the tour as well as former crew member’s accounts of events and sound effects. Now all guests can enjoy the virtual reality ride of the 4D Flight Simulator. Riders can experience “Seahawk: Battle for Iwo Jima” and be launched off the Battleship’s deck in a Seahawk prop plane, fly over the Island of Iwo Jima, avoid anti-aircraft fire, engage in a dog fight with an enemy plane and land in the ocean next to the Battleship. Guests can ride the simulator for $5 with a tour ticket or $6.50 for a simulator ride only. Spend a night on the legendary Battleship New Jersey, a floating museum on the Camden Waterfront across from Center City Philadelphia. From the moment you walk up the gangway, you’ll be greeted with a breathtaking display of the battleship’s size- nearly three football fields long and eleven stories high. During your stay, you’ll develop an appreciation of her strength- an Iowa-class battleship built to “keep floating and keep fighting”. Imagine her awesome power including nine 16-inch guns that once reached land targets nearly twenty-three miles away. 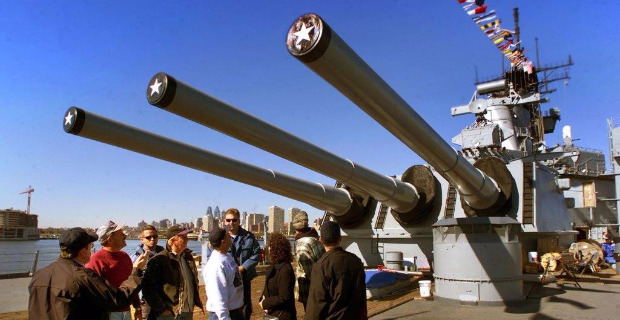 Provide a lifetime of memories for your group with an Overnight Encampment aboard the Battleship New Jersey. Enter the ship’s legendary 16-inch gun turrets. Visit the Combat Engagement Center, and participate in a simulated launch of a Tomahawk missile. See the Captain’s and Admiral’s cabins and the Officer’s Wardroom while you climb up and down the ship’s original ladders and companionways. Even purchase a personalized “Dog Tag”! Kids: You and your friends can spend your birthday aboard our nation’s greatest battleship! Spend an overnight with your party in our award-winning encampment program. Enjoy dinner and breakfast at the chowline, take a guided tour of the Battleship, ride the 4D Flight simulator and sleep in the bunks that the crew of the USS New Jersey once did. Plus we can add a birthday cake for your party to enjoy! The Battleship New Jersey is located on the Camden Waterfront in New Jersey next to the Adventure Aquarium and the Susquehanna Bank Center. The Camden Waterfront is directly across the Delaware River from Center City Philadelphia.